Pence communicated with advisers through his personal AOL account on homeland security matters, a media report said. 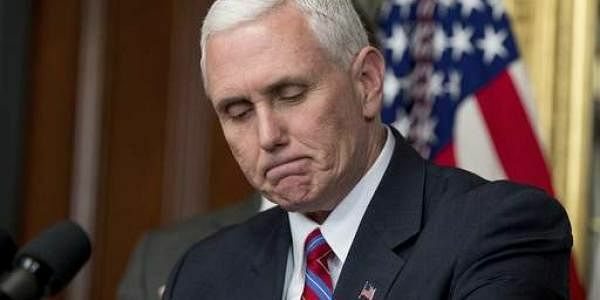 WASHINGTON: Vice President Mike Pence used a private email account to conduct public business as Indiana's governor, according to public records obtained by the Indianapolis Star. The newspaper reported Thursday that emails provided through a public records request show that Pence communicated with advisers through his personal AOL account on homeland security matters and security at the governor's residence during his four years as governor. The governor also faced email security issues. Pence's AOL account was subjected to a phishing scheme last spring, before he was chosen by Donald Trump to join the GOP presidential ticket. Pence's contacts were sent an email falsely claiming that the governor and his wife were stranded in the Philippines and needed money. The governor moved to a different AOL account with additional security measures, Pence spokesman Marc Lotter said, but has since stopped using the new personal account since he was sworn-in as vice president. Lotter said Pence "maintained a state email account and a personal email account" like previous governors in the state. At the end of his term Pence directed outside counsel to review all of his communications to ensure that state-related emails were transferred and properly archived by the state, the spokesman said. As Trump's running mate, Pence frequently criticized rival Hillary Clinton's use of a private email server as President Barack Obama's secretary of state, accusing her of purposely keeping her emails out of public reach and shielding her from scrutiny. Lotter said "the comparison is absurd" because Clinton had set up a private server in her home at the start of her tenure at the State Department and, unlike Clinton, Pence did not handle any classified material as Indiana's governor. Public officials are not barred from using personal email accounts under Indiana law, but the law is interpreted to mean that any official business conducted on private email must be retained to comply with public record laws. The state requires all records pertaining to state business to be retained and available for public information requests. Emails involving state email accounts are captured on the state's servers, but any emails that Pence may have sent from his AOL account to another private account would need to be retained. At the end of his term, Pence hired the Indianapolis law firm of Barnes & Thornburg to conduct a review of all of his communications and that review is still ongoing, Lotter said. Any correspondence between Pence's AOL account and any aides using a state email account would have been automatically archived, he said.